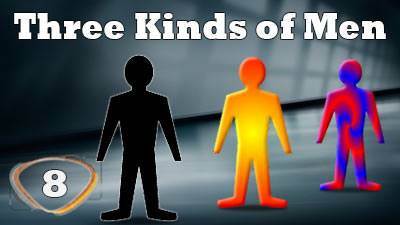 Three Kinds of Men | Lesson 8 in series "All About Me"
In 1 Corinthians 2:14—3:4 Paul talks about three kinds of men in this world. "The natural man receives not the things of the Spirit of God: for they are foolishness unto him." "The preaching of the cross is to those who perish foolishness." The philosophy of the Natural Man is "I save myself." The proof of this is the fruit that comes into his life as a result of his philosophy. (See the chart above.) Ephesians 2:8 which says, "For by grace are you saved through faith; and that not of yourselves: it is the gift of God" is not true of him, as far as he's concerned. He saves himself by being nasty or being nice, but it is not a life of faith in Another. 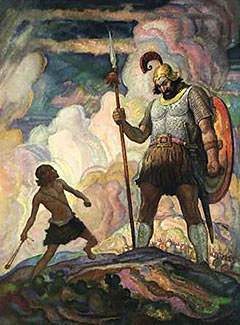 Goliath is a good illustration of this. The first thing we hear about him is his size: 9 feet, 3 inches. Next his security: 157 pounds of brass for his armour. Thirdly, his way of doing things: "Send me a man that we may fight together." And fourthly, his pride: "Come here, little boy, and I'll feed you to the birds." The Natural man has no resources but his own. As a result of this, he is plagued by superiority and inferiority complexes. If he wins he is the greatest; if he loses he feels like ending it all. Lacking faith, he cannot believe that someone else would save him. He doesn't understand God's ways (1 Corinthians 2:14 "The natural man does not receive the things of the Spirit of God: for they are foolishness unto him. 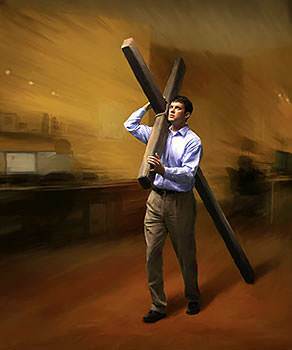 "), and the preaching of the cross (that Someone—Jesus—should die to bring life) is foolishness to him. Fighting, striving to live, yes; but dying to live is very strange, even foolish, to him. Next we notice in the above chart that there is the Spiritual man. He believes in and is experiencing the life that Christ intended all believers to have. His Christianity is more than just a way to get to heaven but is also a way to experience victory and God's saving work on earth. He believes that when Jesus Christ is Lord, He becomes our Saviour in the here-and-now as well as the hereafter. He does not continually practise the sins of the Flesh, although he still is tempted and is able to commit these whenever he fails to rely on the Lord. The Spiritual man walks, listening to the Spirit of God, repenting of his fleshly ways and experiencing the fruit of the Spirit as he is in that right relationship with the Lord. The Natural man and the Spiritual man are at the opposite ends as far as their ways of living are concerned. David is a classic illustration of this. He believed God would save and found He did as long as he relied on Him. 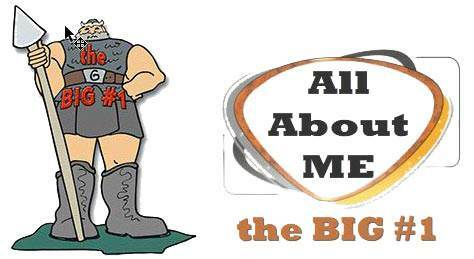 Every Bible character that had the blessing of God upon his life lived the life of the Spiritual man. "And I, brethren, could not speak to you as to spiritual people but as to carnal, as to babes in Christ. I fed you with milk and not with solid food; for until now you were not able to receive it, and even now you are still not able; for you are still carnal. For where there are envy, strife, and divisions among you, are you not carnal and behaving like mere men? For when one says, "I am of Paul," and another, "I am of Apollos," are you not carnal?" He is a believer in Christ and yet constantly operates in the Flesh. He says that Jesus saves and has received Jesus Christ as his Saviour to get to heaven. His problem is living on earth. Here he saves himself. 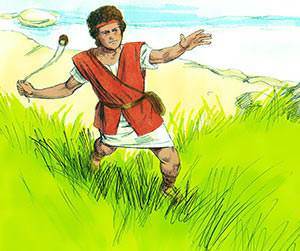 Have you met a Christian who is in rivalry with others, loses his temper, and is self-willed? 1 Corinthians says, "where there are envy, strife, and divisions among you, are you not carnal..." (operating as a Natural man). This person is a great hindrance to the testimony of Christ. 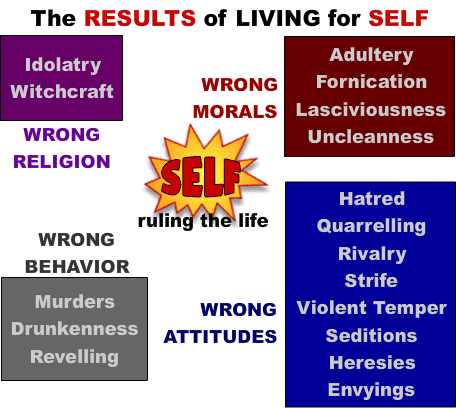 He is one who says, "Jesus saves," but in reality his behaviour gives evidence that he saves himself. The preaching that Christ died for his sins is "Good News" and is appropriated by him, but the teaching of the crucified life has not been appropriated. Christ's death is wonderful, but that there should be a practical crucifixion of the Carnal man's Flesh or that he should die so that Christ can live, is another matter to him. He may even agree to a theological crucifixion of his Flesh, but in everyday behaviour there is little or no evidence that it has taken place. 1 Corinthians 1:18 says, "The preaching of the cross is to those who perish foolishness." It is not foolish to the Carnal Christian as far as getting to heaven is concerned, but seems to be foolish to him as far as living on earth is concerned. He is not allowing the Spirit of God to do His deep work of crucifying the fleshly motives, attitudes, morals, and behaviour in him. Crucifixion in its simplest terms is death through exposure. This is one of the ministries of the Spirit of God in the life of the Christian (exposing the Flesh in us that it might be dealt with at the cross). The objective of the Spirit of God in this is the Lordship of Christ on earth which, in turn, brings the blessing of God upon the life.